We traveled to the 2018 Intermot convention and we got a first hand look at the Shoei GT Air 2. 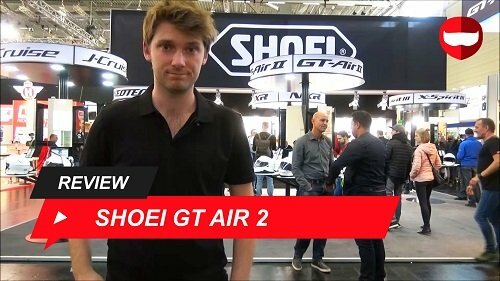 We were able to speak to a Shoei representative who explained the helmet to us, the changes and showed us everything about the Shoei GT Air 2. This is what we learnt! The Shoei GT Air 2 is a much anticipated helmet. It is a full face, sports-tourer helmet and is capable on just about any bike. Being a Shoei helmet, the GT Air 2 is also full of the premium quality which Shoei is known for. As the name suggests the GT Air 2 is a successor to the GT Air and has made plenty of improvements in plenty of areas. This helmet fits in between the Shoei Neotec 2, a modular touring helmet, and the Shoei X Spirit 3, a racers full face helmet. It is an all rounder with few of the faults that we would expect from an all rounder helmet. So as always, we will start off by looking at the shell of the GT Air 2. The shell is pretty typical for Shoei because it is made out of their AIM material. This is a high quality material with multiple layers of fiberglass and organic fibers (organic = carbon). So all in all, this results in a very strong shell with a relatively light weight. The outer shell is also available in 3 different shell sizes. The shell hasn’t changed much from the original GT Air but it honestly didn’t need to. When it comes to the shape of the shell, there have been some changes though. That is because they have added some more aerodynamic features to let it glide through the air with ease. Now for the visor and it doesn’t disappoint. It is anti-fog, anti-scratch and Pinlock prepared. This last part is handy because Shoei have provided a Pinlock in every box. The visor isn’t that different from the original GT Air but the internal sun visor did get a nice upgrade. First of all, they have adjusted the mechanism so that it drops down better and they have also made it bigger. This is generally a nice improvement but the size of a sun shield can be quite personal. At Champion Helmets we are pretty happy with it overall though. When it comes to the ventilation system, the GT Air 2 should have you pretty well covered. Everything here is what we would expect from a sport-touring helmet. Plenty of air ventilation, comfort and user friendliness. The chin and top vents allow plenty of air into the helmet and the vents at the back allow it to escape. Overall, the system has been improved upon when compared to the original GT Air and it will give both better ventilation and better air extraction. The ventilation is very good on this helmet. Noise isolation is a big aspect of any touring helmet and it is no different for the GT Air 2. I can say that the noise isolation is very good. Shoei improved on this with aerodynamics testing, a windtunnel and by generally trying to get everything to fit perfectly together. Now it isn’t perfect and depending on your riding style/bike will be better or worse for you but it did seem pretty quiet. The inner liner is very comfortable. Shoei makes good liners and they have continued that trend here with the GT Air. Shoei calls it their 3d liner and despite the silly sounding name, it is good. It is removable, washable, antibacterial, moisture absorbing and quick drying. All good features of a liner. This one takes everything a little step further though and this really helps with the overall high quality feel of the GT Air 2. Plus, you get an emergency quick release on the cheek pads which may help to save your life one day. There is also a steel micro ratchet retention system to keep the helmet on the head and protect the wearer. Shoei teamed up with Sena to make the Sena SRL2 intercom system which was specifically built for Shoei’s latest helmets. What that means is that the system will be easy to install on the GT Air II. It is practically almost there already and doesn’t require too much effort to get it working. The real advantage of this partnership though is that the liner, EPS and noise isolation of the helmet were built around this system so you can install a communication system without being worried about anything going wrong elsewhere in your helmet. This is a nice plus but you can always fit in other systems on the helmet if you prefer. So this has been our take on the Shoei GT Air 2. This full face, sports-touring helmet is definitely sitting in the top of its class and should stay there for a few years to come. They have managed to do a good job of taking the original GT Air and simply improving upon it, which isn’t always as easy as we think it is. You should be comfortable taking this helmet with you pretty much anywhere and it will protect you and still be comfortable, pretty much anywhere. Thanks for reading and remember to check out our YouTube channel if you want to see more!